A busy but not entirely productive month. We moved the Narrowboat onto the Grand Union which involved a trip down the tidal Thames from Teddington lock to Brentford. I was amazed how much Brentford has changed since we last passed through there. All apartments and Marinas, very pleasant but a long way from it's roots as a main thoroughfare for goods from the London docks. There are some BIG boats on the Thames. 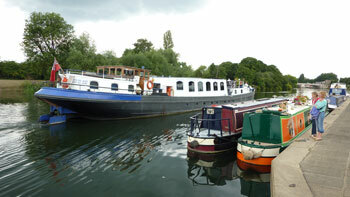 Here we are dwarfed by a Dutch barge whilst moored up outside Hampton Court Palace. The hull is now fully sheathed and I am very happy to have reached this stage. I was hoping to get it sanded but so far I've only had time to scrape the areas of peel ply overlap. So this is the first task for September. Having got the Narrowboat moved and moored up for the autumn it was time for some maintenance. 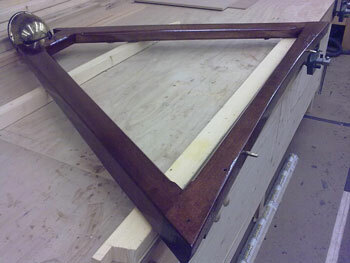 So off came the cratch support frame and into the workshop. 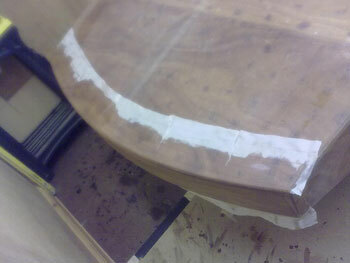 Here you see it sanded and with a coat of epoxy to improve it's weather protection. Hopefully I'll have this vanished and back on the boat next month ready for an Autumn trip into London.